Strong direction and equally strong central performances elevate Sicario above the level of grisly but gripping cartel bust drama, to something with as much food for thought as food for thrills. After a raid on a Phoenix home reveals a hideous discovery, FBI agent Kate Macer (Emily Blunt) is seconded to an inter-departmental anti-drug cartel task force under the supervision of Matt Graver (Josh Brolin) and the mysterious Alejandro (Benecio Del Toro). The aim of this taskforce is to supposedly “dramatically overreact” to the afore-mentioned grim discovery, but as events unfold, Kate begins to suspect more dubious motives behind this essentially covert operations team. The three leads are excellent, with Blunt proving her versatility yet again, and Brolin eating up the screen as usual. Yet for me it is Del Toro who steals the show. He oozes both menace and a deeply haunted quality in every scene he occupies, ever an enigma until the shocking finale. Denis Villeneuve, who directed the overheated but brilliant Prisoners, orchestrates a handful of remarkably visceral set-pieces (courtesy of Taylor Sheridan’s terrific screenplay). The opening is grab-you-by-the-scruff-of-the-neck shocking, and a number of subsequent sequences – including one in a traffic jam, and a night-vision assault in a tunnel – are incredibly tense. 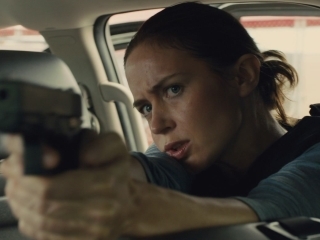 I was often reminded of Michael Mann’s best work (for example Heat) as well as previous movies about tackling drug cartels (such as Traffic), but really Sicario is unique enough to stand alone on the quality of direction alone. However, my superlatives are not aimed purely at the director but also cinematographer Roger Deakins who surely, surely must have that long overdue Oscar in the bag. One image alone, where the taskforce are silhouetted against a sunset prior to the afore-mentioned tunnel raid, would get this my vote if I were an Academy member. On top of that, the film is brilliantly edited by Joe Walker, and Johann Johannson contributes an atmospheric score. Sicario apparently means hitman. But whilst the title does ultimately refer to a specific individual in the narrative, the concept applies in a number of ways to other members of the cast, sometimes literally and sometimes metaphorically. This is not a tale of good versus evil, but of shabby moral compromise, as increasingly murky and grey areas are explored. Like our tortured protagonist, the viewer is left reeling in despair at the bitterly defeatist approaches taken in tackling what is unquestionably a hideous problem. Amid that anguished quagmire there is plenty of shocking violence and strong language, though entirely contextually justified. All things considered, Sicario is dark, riveting, and possibly the best thriller of the year.